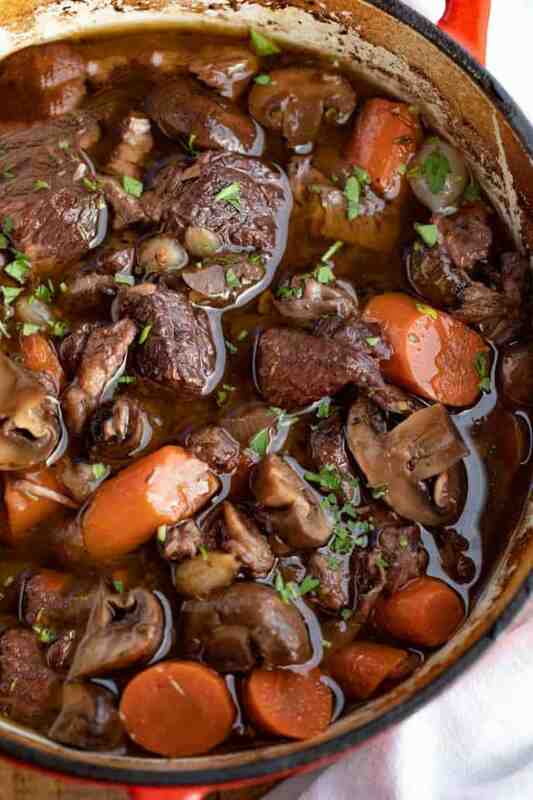 Beef Bourguignon made with pearl onions, carrots, mushrooms, beef, and burgundy red wine is a CLASSIC comfort food that’s hearty, filling, and perfect for when it’s cold outside! 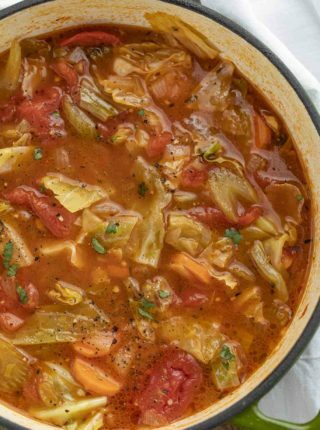 Our favorite winter soup right now is Cabbage Soup and we love these classic comforting dinner recipes in the winter including Ultimate Slow Cooker Pot Roast, Slow Cooker Beef Chili and Ultimate Slow Cooker Beef Stew. 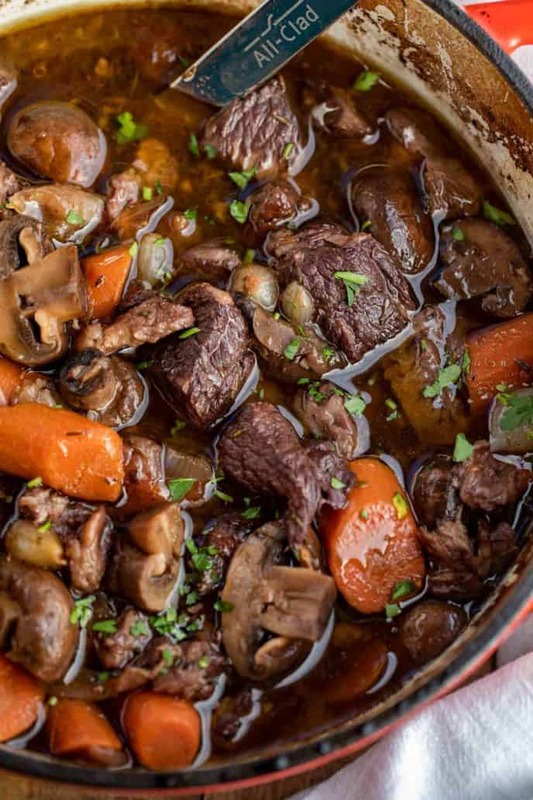 Beef Bourguignon is a classic recipe, made with red wine, beef, veggies, and seasoning in a dutch oven that starts on the stovetop and finishes in the oven. Nobody beats Julia Child when it comes to beef bourguignon, but I can tell you that this recipe comes pretty close. You have to set aside a good 3 1/2 hours of cooking time to make this, but it is absolutely worth it for the end result. WHAT IS THE DIFFERENCE BETWEEN BEEF STEW AND BEEF BOURGUIGNON? 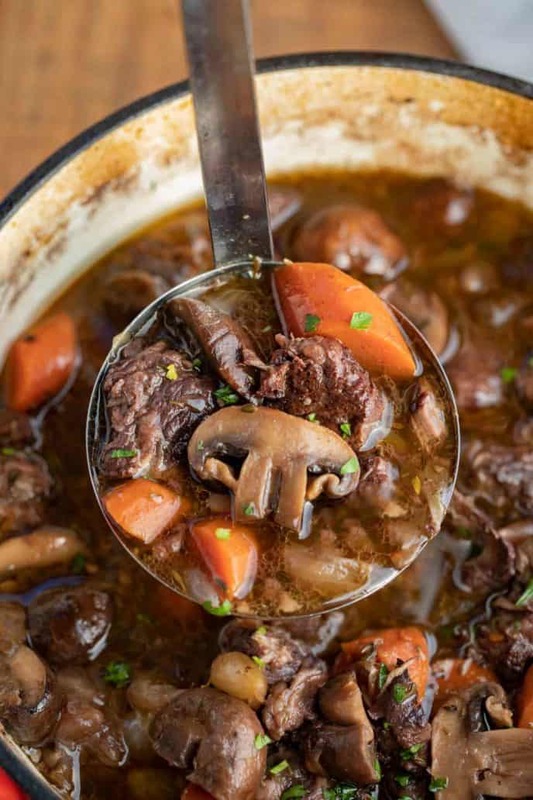 Beef stew and beef bourguignon traditionally have very similar ingredients, but beef bourguignon is made with the addition of red wine, and slowly cooked in the oven for several hours. 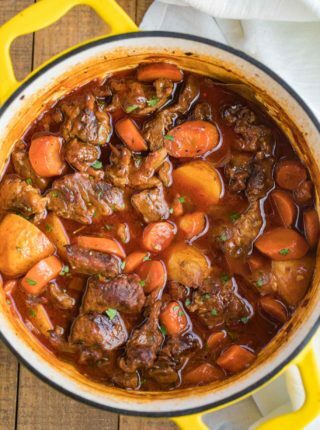 Beef stew typically doesn’t have wine, and can be made in less than an hour on the stovetop. If you love adding more vegetables to your soups I’d recommend trying a recipe like Slow Cooker Vegetable Beef Soup. WHAT IS THE BEST MEAT TO USE FOR BEEF BOURGUIGNON? 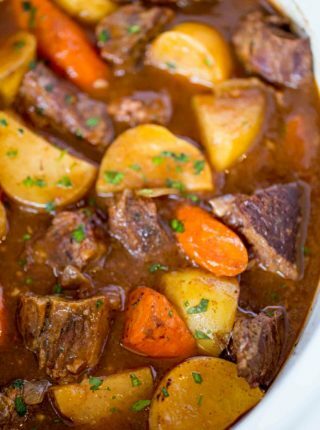 You can go the easy route and get beef stew meat, or opt for cutting your own out of chuck, oxtail, or brisket. You want the meat to have a good amount of marbling, leaner cuts will dry out as your stew cooks, and add a lot more flavor to the beef stock in general. Burgundy is traditionally used to make the beef stock in a beef bourguignon recipe, but if you don’t have burgundy you can try using a pinot noir or chianti. The rule is that you should only be cooking this with a full-bodied red wine that you would also drink, or you may not like the flavor in the food! WHAT IS BEEF BOURGUIGNON TRADITIONALLY SERVED WITH? Traditionally this dish is served with steamed potatoes or noodles, or you can serve it over rice. I also like serving this stew with a toasted baguette and some butter. This recipe is perfect to make ahead because the flavors only get better the longer it sits. Make it the night before, then just reheat in the oven until warmed through. Turn on the sauté feature on the Instant pot. Toss the beef with flour and seasoning, then add the butter to the pot and brown the beef on all sides. Remove and set aside. Add vegetables and sauté for 4-5 minutes, stirring. Then add beef back in with all other ingredients. Lock the pot lid and pressure valve. Set for manual on high for 30 minutes, then allow the pot to release naturally. Garnish with chopped parsley or a sprig of fresh thyme and serve over potatoes, or just enjoy it by itself! For more flavor, cook 5-6 slices of chopped bacon with the onions. You can substitute crimini or button mushrooms for brown mushrooms if that’s what you can find without sacrificing any flavor. This recipe uses store-bought frozen pearl onions, which are typically pealed already. If you use fresh onions, you may have to peel them. Use a slotted spook to dip them into boiling water for 20-30 seconds, then the skins should come off easily. Omit the salt and use unsalted butter if you want to make a low sodium version of this dish. If you want to make this in the slow cooker, check out my Slow Cooker Beef Bourguignon! 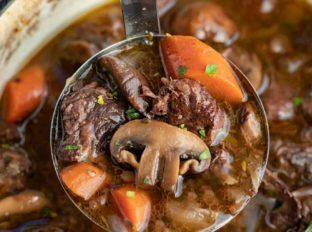 The slow cooker beef bourguignon is perfect for setting the night before, because you’ll wake up to stew that is perfectly cooked and ready to serve later that day. You can sub the fresh minced garlic with 1/2 teaspoon garlic powder if you don’t have cloves. Once the stew is done, remove the bay leaf with a slotted spoon. They have a very strong flavor, so you don’t want anyone biting into it! Julia Child teaches us that leaving moisture on the meat will steam the bottom instead of browning it. Pat the stew meat with paper towels, to get it really dry before coating it with flour. Julia Child also reminds us to make sure not to crowd the meat, or it won’t brown properly. If your butter is getting too hot you can add some extra virgin olive oil to it to stop it from burning until the meat is browned. Beef Bourguignon made with pearl onions, carrots, mushrooms, beef, and burgundy red wine is a CLASSIC comfort food that's hearty, filling, and perfect for when it's cold outside! Toss the beef with the flour, salt and pepper and add to a large dutch oven that is on medium high heat with the butter melted in it and brown the beef on all sides, about 4-5 minutes. Remove the meat from the pot and add in the onions and carrots and cook for 4-5 minutes until they start to brown before adding in the garlic, wine, bay leaf, thyme and the beef. Cover and cook in the oven for 2 hours then add in the mushrooms and cook for an additional 1 hour. Made this today. Awesome recipe. The meat was so tender it fell apart and the flavors are amazing. A new favorite in my house. So glad you loved it, Lisa! Thanks for the 5 stars. So I figured out from looking at other Beef Bourguignon recipes that the mushrooms do go in the last hour of cooking. I had already combined ed all the veggies so I let it ride. They came out just fine. Your recipe is really delicious though I did add some beef broth in case my husband didn’t like all the wine. It was great. The sauce was perfect and thickened nicely. I never had this before and always wanted to try it. Thank you for a wonderful recipe!! You’re welcome, Sandi! Thanks for the 5 stars! The recipe says to cook carrots onion and mushroom then add garlic parsley bay leaf and meat and cook for 2 hours. Then it says to add the mushrooms and cook another hour?? I’m making this now and have veggies all combined. Is this ok or will it ruin mushrooms? So sorry about that. You’ll be ok either way but in the future they shouldn’t be included with the carrots and onions. Adding them later helps to keep more of their shape so it’s more of a texture preference. Hope you enjoyed it! This couldn’t look any more perfect! I need to try this immediately, it looks so good! This is my kind of comfort food! Really so easy to make and always a winning dinner! The ultimate comfort meal! So easy and flavorful! Pretty sure I could eat this all day long! Love it! Such a fabulous classic and your rendition looks delicious! Nothing beats this classic! So comforting and delicious! 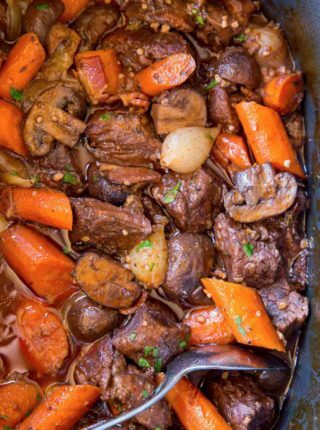 Never had beef bourguignon before, but after seeing how good this looks I think I’ll give it a try!